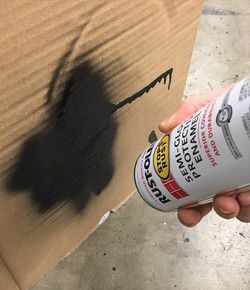 Have you ever used a spray paint once and found that the next time you used it, the paint would spit or splatter out of the nozzle. This can be frustrating and can cause a poor paint job the second time around. Also, your hands usually get covered in paint because the clog is causing some paint to roll down the can and onto you. This mess that can be easily prevented. When you are finished (for the time being) with the can of spray paint, be sure to flip it over and spray for a couple of seconds into a paper towel. Then wipe the spray tip clean and spray for another couple of seconds into the same paper towel. By doing so, you have removed any of the solids that could cause the spray tip to clog has it dries in between uses. Now, it is safe to store and you can feel confident that it will spray perfectly during the next use!